First, let’s cover the Android gamepad Double-Jump became completely obessed with: the Gametel Controller. This nifty device hooks up to any Android device running 2.1 or higher and allows you to transform your phone in a less frustrating gaming system. Which is awesome but the sad part is that it’s currently only sold in Europe. However, the bright side is that the device is available on Amazon and does ship to the states. Additionally, the controller is easy to attach and appears to be the perfect size for on-the-go gaming with up to nine hours of play time. Next up was the Advance N900 DB Wireless Dual-Band N+ Router which might be interesting for folks, like myself, that have a vast number of devices connected to their home networks. The problem the Advance N900 addresses is the congestion that’s often caused when you have too many devices connected on the same network. While being geared more towards folks that stream online video content, like Netflix and YouTube, I think this might be the perfect device for those of you out there that are currently streaming your online gaming sessions since it’s able to go up to speeds of 450Mbps. Not really available at the moment but be sure to be on the look out for it later this year! Equally as interesting were the many headsets and speakers that were available. From The House of Marley, you not only get stylish headsets but you also get the opportunity to supporting the folks at 1Love, the Marley Family charitable organization. With every purchase of a Marley product, a portion of the money goes directly to the 1Love charity. Additionally, they are all made from eco-friendly materials while still providing amazing sound and superior bass performance. If you’re interested in learning more, I’d suggest you check out The House of Marley‘s website to learn more about their products and the 1Love charity. But the amazement didn’t stop with them. The folks over at Sonomax were on hand showing off their Scultped Eers. It’s a customized headphone kit that creates your own personalized in-ear headset in just five minutes! Whats included in the kit is a special device which you place in your ears for five minutes to allow it to create your very own customized headset which fits in your ear and won’t fall out even while jogging. While they are not water resistent or waterproof, the Eers are a great solution for anyone who has a constant issue with their in-ear headphones falling out. Best part is, they are available right now! And lastly, I was extremely astonished by the vast number of fashion items available. Both men and women this year can keep their tech around while looking extremely fashionable. From backpacks to clutches and wallets, the folks at Hex and Case Mate have you covered! 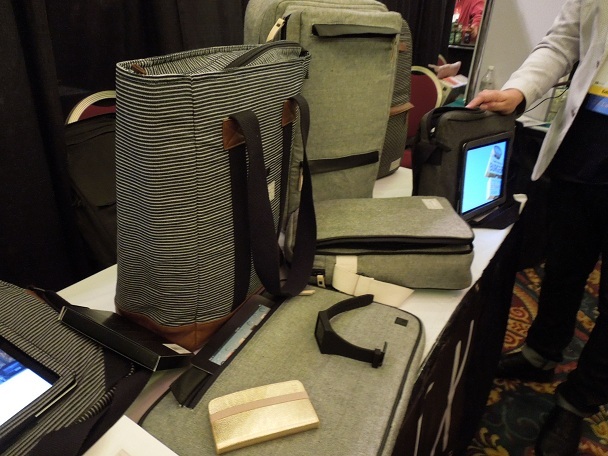 While only being around for a year now, the folks at Hex took their learning from working with retailers like Bloomingdales to come up with a line of cellphone cases, bags, back packs, and even watch cases that not only look nice but conceal your tech devices within them. All reasonably priced with most, if not all, products being under $100. Absolutely perfect for any technophile male in your life! Case Mate, on the other hand, was geared for the fashionista. With brightly colored phone cases and amazingly crafted wallets, these were definitely more my style. 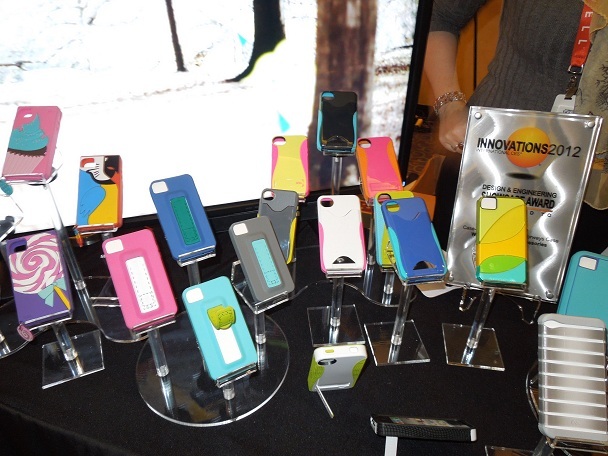 While Hex was totally subtle in it’s style, Case Mate‘s products definitely made a statement. Their wallets had a great little slot which appeared to fit almost any phone while their clutches were stylish enough to hide your cell phone while keeping all your valuables in place. It’s clear from tonight, that I have a long and exciting week ahead of me and I’ll be sure to share as much as I can for you! 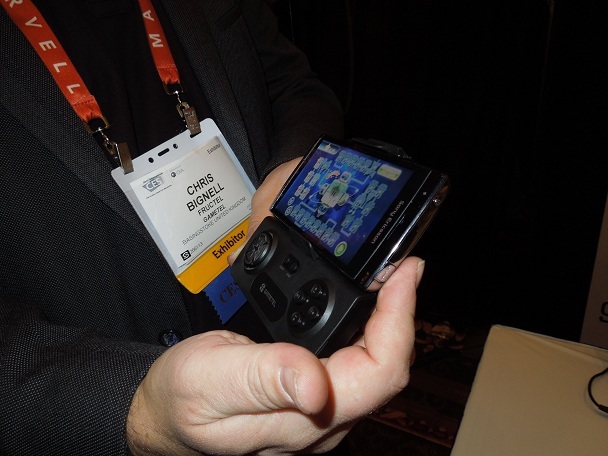 For now, be sure to check out our Facebook gallery for all the latest photos from CES 2012! The Hidden (3DS) – ReviewNew “Eastbound & Down” Teaser; Kenny Powers Returns Feb. 19!